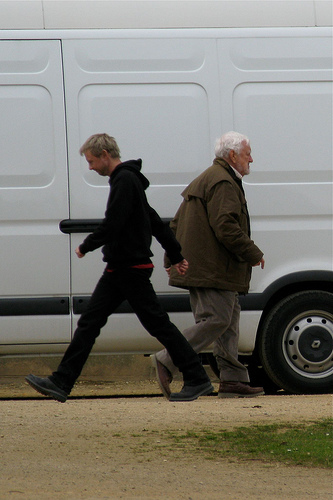 Cribbins played Donna’s grandfather Wilf Mott in series 4, and of course John Simm appeared in series 3 as The Master. So far, this substantially confirms recent rumors that Tennant’s final stories would feature a return of Martha Jones, Donna Noble, Rose Tyler (again! ), Wilf Mott, and the Master. Personally, a lot of this seems a bit like a repeat of the series 4 finale, except with the Master instead of Davros, and I *really* don’t think we need to see Rose again. But if done well, I welcome another appearance by Wilf & Donna, who I thought were just amazing in series 4, not to mention another outing for Simm’s Master! I’ve heard for some time that Martha would be returning to ease the transition from Tennant to Smith, which makes sense from a historical perspective — most of the times the Doctor has regenerated they have deliberately avoided recasting the companion at the same time to make it easier on the audience. And, in fact, back in the beginning of the ’80s, then-producer John Nathan-Turner asked Louise Jameson to return as Leela to ease the transition from Tom Baker to Peter Davison, but she declined the offer. So the idea is definitely not without precedent. Now obviously since Rose returned, making a lie of the whole “trapped forever in another dimension with no way to return”, I’m sure something can be cooked up to explain Donna’s return despite how she supposedly could never regain her memories of her time with the Doctor without it killing her. My guess? The bit of the Doctor that’s stuck in Donna’s head (as well as possibly the half-human “Doctor” who’s off with Rose in Pete’s World) may be needed for him to regenerate properly, much like how the Watcher aided the fourth Doctor’s regeneration in Logopolis. Once this happens, it’s no longer in Donna and she is safe to remember again. One other question that comes to mind is why is Simm’s hair been bleached blond? Maybe it has something to do with the color of the hair of the woman who’s hand we see picking up the Master’s ring at the end of Last of the Timelords…? Whatever happens, I’m excited to see the specials, starting with Planet of the Dead in a little over a week. It’ll be sad to see David Tennant’s time end as the Doctor, but getting a new Doctor is always exciting and something to look forward to. It is filed under Doctor Who, Doctor Who Companions, Doctor Who News, Doctor Who specials, New Doctor Who. I’m very much looking forward to this weekend — new Doctor Who AND new Red Dwarf! Very cool. only 1 day until planet of the dead!!!!!!!!!! I want the master to return. I loved it when john played the Master in series 3 and since then ive really been wishing the master to return! Just cross your fingers and we might get lucky. And im really looking forward to Donna retuning! She was the best companion so far. I dont think rose should come back, i feel it will be to much if they ALL came back. But it would be nice to see Jack or Martha, but not everyone! i actually saw a picture of the 5th series filming with Matt Smith as the Doctor. He was holding the sonic screwdriver, which weirdly enough looked like a combination of both Ten’s and the Master’s. I think that Rose coming back is a very bad idea, from anyones perspective but the Drs. We don’t want her back but I’m sure if there was anyway to get her back, the character of the Dr himself would love it. Its fantastic to see John Simm and Cribbins coming back. The idea of how Donna can return as a character without losing her mind is fantastic, I hope if they do not use this idea then its at least as brilliant. I’m not sure we need Martha back, if Donna returns – couldn’t she be the new companion? and also, what happened to the idea of the Dr having more than one companion at a time, not just for special occasions? this has precedent in the Who universe as well and was done quiet well at the time. And will the Dr’s daughter return? Will we see Donna mother? What role will she play? Or will they manage to keep her out of it? Questions, Questions, Questions. As ever, I can’t wait for the next episode! !